The Old Chemist Shop Antique Centre is an antique dealer which buys and sells a range of old collectible items including furniture and ornaments. 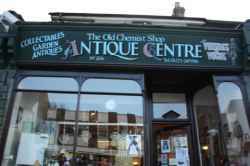 Based in Mill Road, Cambridge, The Old Chemist Shop Antique Centre is an antique shop. The Old Chemist Shop Antique Centre is in Mill Road Cambridge. You can view a list of neighbouring businesses by going to the Mill Road page. If you would like a list of other listings throughout Cambridge, please visit the Antiques section of this website. Note: the pin is positioned at the postcode centre, and may not correspond with the precise location of 206 Mill Road.